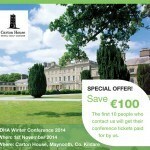 Join Dr Richard Lee Kin at the Irish Dental Hygienists Association (IDHA) winter conference 2014 in the beautiful Carton House hotel just outside Maynooth, Co. Kildare where he will be giving a lecture on Dental Records for Periodontal Patients. This is a rapidly growing problem and he will cover what records are essential for keeping out of trouble and case studies including some useful check-lists to save you time & money. He will also be giving a hands-on course on the management of furcation involved teeth. Email us at info@mintclinic.ie to express your interest in attending the conference and the first 10 people will get their tickets paid for by us.